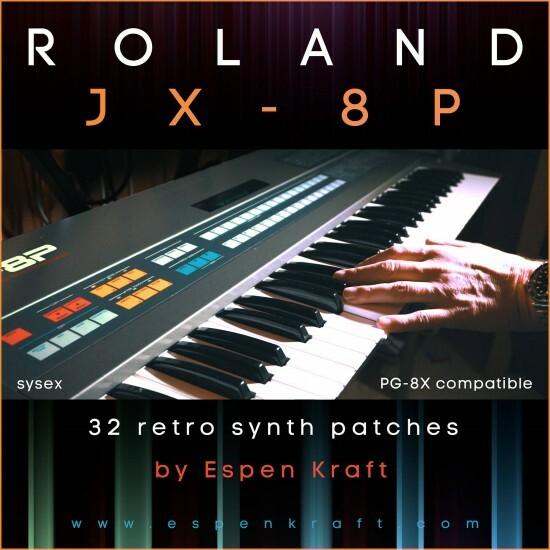 Espen Kraft - Roland JX-8P / PG-8X - 32 Retro Synthwave Presets - Support Artists, improve productions, enter the void. A download pack of 32 patches for the Roland JX-8P in the sysex format.The patches are created from me and many of them is sounds directly from my album "Those Days..
https://www.youtube.com/watch?v=VRI3vQe_SRo&t=33sYou will have to transfer the patches to your Roland JX-8P through midi cables. You can use a MIDI sysex transfer program: http://www.midiox.com/ or https://www.bome.com/products/sendsxThe patches is also compatible with the excellent VST plugin PG-8X. Can be downloaded here:https://sites.google.com/site/mlvst0/In use on the PG-8X all you have to do is load the patches into the PG-8X from the folder on your computer.